11:00 p.m. Closing statements: Sanders began with noting that he grew up in Brooklyn and that he disagrees with Clinton that you can get money from Wall Street and from super PACS and then to help regular works at the end of the day. Clinton said she's "very grateful" for being elected twice to the Senate to represent New York and she said they took on the repercussions of 9/11 together, they secured funding to rebuild New York and to help first responders who endangered their health after 9/11. "I'm asking for your support again in the primary on Tuesday," Clinton said. 10:55 p.m. Asked if he plans to take the nomination fight to the floor of the Democratic National Convention in Philadelphia, Sanders said, "I think we're gonna win this nomination." "I'm going to work my heart out here in New York until the polls close on Tuesday," Clinton said. She expressed confidence that she'll win the nomination, unite the party and move on to the general election. 10:46 p.m. Clinton is asked if she would ask President Obama to withdraw his nomination of Merrick Garland to the Supreme Court if she's elected president. "I am not going to contradict the president's strategy on this. I am not going to engage in hypotheticals," Clinton said. Sanders said, "If elected president, I would ask the president to withdraw that nomination. We need a Supreme Court justice who will be crystal clear -- and this nominee hasn't done that -- that he or she would vote to overturn Citizens United." Clinton then expresses dismay that none of the questions at any of the Democratic debates has been focused on a woman's right to choose. 10:43 p.m. The debate turns to Social Security and Clinton is asked if she would support raising the cap on taxable income. She said she supports the idea of making the wealthy pay by taxing passive income and other investments made by the wealthy. Clinton said she wants to protect Social Security just like Sanders. She also talked about helping widows and divorcees. 10:29 p.m. Sanders was asked to elaborate further on his comment regarding the 2014 conflict between Israel and Gaza. "Was that a disproportionate attack? The answer is I believe it was," said Sanders who said that he is still pro-Israel and spent a lot of time when he was younger in the Jewish state. Clinton weighs in and said she negotiated the ceasefire between Israel and Hamas in November 2012. She defended Israel's right to defend itself. "They do not seek this kind of attacks. They do not invite rockets raining down on their towns and village," Clinton said. "You have a right to defend yourself...that does not mean that you don't take appropriate precautions. It also does not mean that we should not continue to do everything we can that we try to reach a two-state solution." 10:17 p.m. Sanders is asked to react to a statement he made in 1997 in which he said U.S. spends tens of billions of dollars on NATO while European countries don't contribute as much. "We spend about 75 percent of the entire cost of the military aspect of NATO," Sanders said at the debate, adding that because France and the United Kingdom have good healthcare and free college education programs, "You know, what? Yeah, I do believe the countries of Europe should pick up part of the burden for their defense." Clinton said she agrees that Europe's NATO members should contribute more funding, but she said she wouldn't withdraw from the alliance if they didn't do that. 10:13 p.m. President Obama recently said one of his worst mistakes of his presidency was not preparing for Libya after the fall of Muammar Gaddafi. Asked if she was partially responsible as secretary of state, Clinton said the U.S. did a "great deal" to help Libya including facilitating two successful elections. Sanders slammed Clinton's record supporting regime change: "This is the same type of mentality that supported the war in Iraq." 10:00 p.m. Clinton is asked to comment on her recent statement about how she is sick and tired of Sanders lying about her record, especially on fossil fuel industry campaign contributions. She said that she has proposed getting rid of subsidies for big oil and said she and Sanders have "relatively small amounts of contributions from fossil fuel companies" but not supported by big oil. Sanders said, "As I understand it, 43 lobbyists for the fossil fuel industry gave the maximum amount to Clinton's campaign." 9:45 p.m. Clinton is asked whether the 1994 crime bill, which included provisions that imposed tougher prison sentences, that President Clinton signed was a net positive or negative. She said that there were some positive action and changes, but it also requires lawmakers to revisit it and correct it. "Sentences got much too long," Clinton said. Asked to react to Clinton's "superpredators" remark from the 1990s, Sanders said, "It was a racist term and everybody knew it was a racist term." Clinton has said that that remark was a mistake. 9:36 p.m. Clinton is asked if she was seriously blaming Vermont for New York's gun violence in a recent statement. She said "No" and Sanders started to laugh. She said this is "not a laughing matter" and said 90 people a day are killed as a result of gun violence as well as 33,000 people per year. "We need a president who will stand up against the gun lobby," Clinton said. Sanders said he doesn't think he should give the families of the 2012 Sandy Hook shooting massacre an apology, but added that he "supports them and everyone else who want the right to sue" gun manufacturers. 9:29 p.m. Blitzer points out that Clinton has supported New York's minimum wage increase of $15, but hasn't supported such a large increase for the federal government. Asked if a Democratic-controlled Congress sends her legislation that raised the federal minimum wage to $15, would she sign it, she said "Well, of course I would." Clinton said that she has supported "the fight for 15" and said a number of unions leading that fight have endorsed her for president. "What I have also said is we have got to be smart about it," she said, arguing that New York has the right approach by quickly going from a $12 minimum wage to $12.50 and $15..."Go quickly as possible to get to 15," she said. Sanders supports a $15 federal minimum wage. 9:23 p.m. Clinton is asked why she won't release the transcripts of the speeches she delivered to Wall Street. "Let's set the same standard for everyone. Let's expect the same standard on tax returns," Clinton said, referring to Sanders not releasing his returns yet. Sanders then said he will release his returns from last year on Friday. "We've been a little bit busy lately. You'll excuse us," Sanders said, adding that his tax returns are very boring and that it will show "no big money from speeches, no major investments." 9:16 p.m. Sanders is asked to if he can name one decision Clinton made as senator that shows she favored banks because of the money she received. He completely dodged the question and just accused Clinton of being "busy giving speeches to Goldman Sachs." 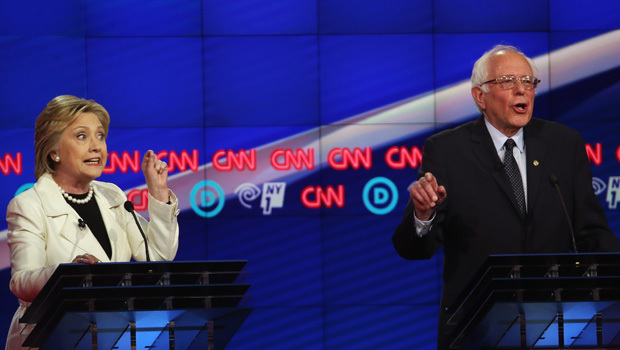 "As you can tell, he cannot come up with any example because there is no example," Clinton responded after Sanders failed to come up with one. "I called them out on their mortgage behavior." 9:08 p.m. Sanders is asked to reflect on his statement from last week that Clinton is not qualified to be president. He said he was just responding to attacks from the Clinton campaign. He added, "of course" Clinton has the intelligence and experience to be commander-in-chief, but said he questions her judgement. "I do question her judgement, which voted for the war in Iraq...voted for every disastrous trade agreement and i question her judgement about wanting super pacs," Sanders said. On the attack that she's unqualified, Clinton said, "I've been called a lot of things in my life. That was a first," and noted that New York voters elected her twice to the U.S. Senate and that President Obama trusted her to serve as his secretary of state. Clinton then highlighted a recent interview Sanders did with the New York Daily News and she suggested it showed he has poor judgement. She said he didn't know how to address his biggest issue: breaking up the big banks. "When asked, he could not explain how that would be done," Clinton said, adding that he also couldn't answer questions about a number of foreign policy issues including Israel, Afghanistan and counterterrorism. 9:00 p.m. Sanders delivers first opening statement and says that he started in the race 70 percentage points behind Clinton and referred to two recent polls that had Sanders ahead in the Democratic race. He noted that of the last nine caucuses and primaries, he won eight of them by landslides. Clinton touted her eight years as a U.S. senator representing New York from 2001 until 2009. She praised the state's recovery after 9/11 and took a swipe at Ted Cruz who has mocked "New York values." "We worked hard to keep new york values to be at the center of who were are and what we do together," Clinton said. 8:50 p.m. ET Hillary Clinton and Bernie Sanders face off in their Brooklyn debate in 10 minutes at 9 p.m. ET on CNN. It's co-hosted by NY1 News and comes only a few days before New York's critical primary on Tuesday. It's the first debate the two Democratic candidates have done in over a month.